Finding electronic holiday cards for business that arent garish or tacky or feeble attempts at humour can be quite a challenge. 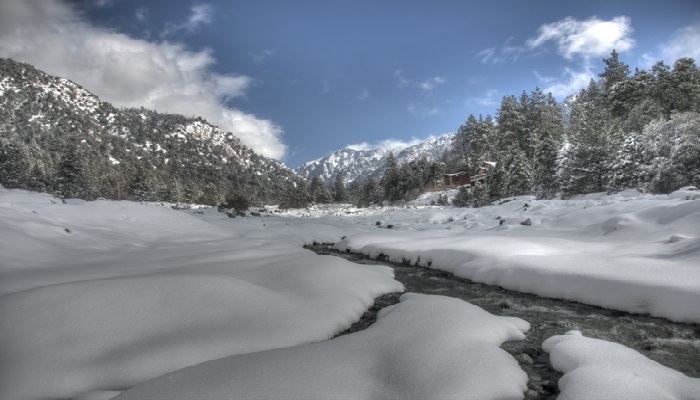 Striking the balance for business associates is never easy but check out this amazing image of a mountain stream cutting through the thick snow. With snow capped mountains to the left, and pine trees speckled with snow to the right you want to get on your thick winter boots and follow that stream to see where it goes. This ecard speak volumes about what is many people's idea of a perfect winter wonderland, especially when you are rushed off your feet at work in the hectic run up to the seaonal holiday period themselves. A picture of peace and tranquillity can make a big difference to a stressed executive, and you won't find business holiday ecards that are more peaceful and tranquil that this once. Click on preview now and see it how it looks when activated. The music is optional, as is the text. That is the beauty of design yourself ecards; you can leave them as they are or add those little personal touches. You will put a smile on the face of business associates who receive this in an email, and isn't that what Christmas is all about?